I am in the market for a new living room chair or recliner and figured someone here would have some good advice. I am looking for something that is comfortable first with appearance a distant second, and have a decently sized living room. I will use the chair for reading, listening to music and watching occasional TV/movies, and I would like something with some reclining option and will probably pair with an ottoman. The hard part of this is I am on the tall side (by normal standards not v-salon standards) at 6'3" and have an old neck injury that makes me very sensitive to back position and support. I prefer a firm supportive type chair over a soft sink in type one. I visited the local ekornes/stressless dealer to try these out, but found they were all too short (even in the tall size) and pushed my upper back/shoulders forward in a very uncomfortable manner. The saleswoman was very surprised that they were all too small and could clearly see the issue I was having, but did not have any suggestions on better options. I would prefer not to spend days driving around to different furniture stores with no aims, so I am looking for suggestions on specific items to look for and try that other tall people here have found comfortable. These may be worth a look. I have this chair. it's ok. but not what i'd want as "my" go to chair. I am about same height as OP, and have similar problem. my back is very, very, very picky. Lumbar support is NOT my friend. very few places have chairs that work. I've spend a lot of money chasing the right chair--at home and at the office. The only solution, is do go and do what you said you don't want to do: I would prefer not to spend days driving around to different furniture stores. Do that. At home, the best chair for me is a Century (not sure they're still around). Expensive, well made, large everywhere. At the office, while I spent thousands at "Relax the Back" on each miracle chair. Ended up at office depot, $149 special did the trick--gone through several of these. But i sit in everyone of them first. I think this is a beautiful chair. 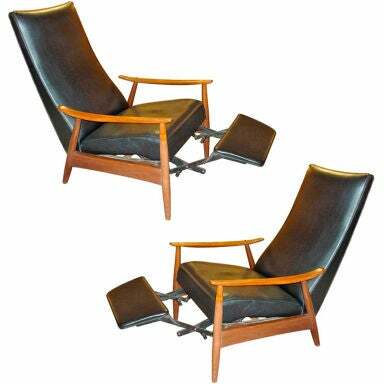 A bit like a Hans Wegner design but actually by a designer named Milo Baughman and built by a North Carolina furniture company called Thayer Coggin. I think the design is from the 60's. DWR stocks the re-issue of the chair. High back and while it reclines, it isn't like some of the dentist chair recliners out there. There are different versions or copies with different amounts of cushion in the pads, but the original and the re-issue have nice firm cushions. I bought one of these. The only problem is that I tend to fall asleep in the chair. Looks like shopping around will be required. I will check out the zero gravity chairs at the relax the back store. The DWR chair looks interesting as well. I am not a fan of the appearance of the Eames chair, but I will sit in one if I see it. 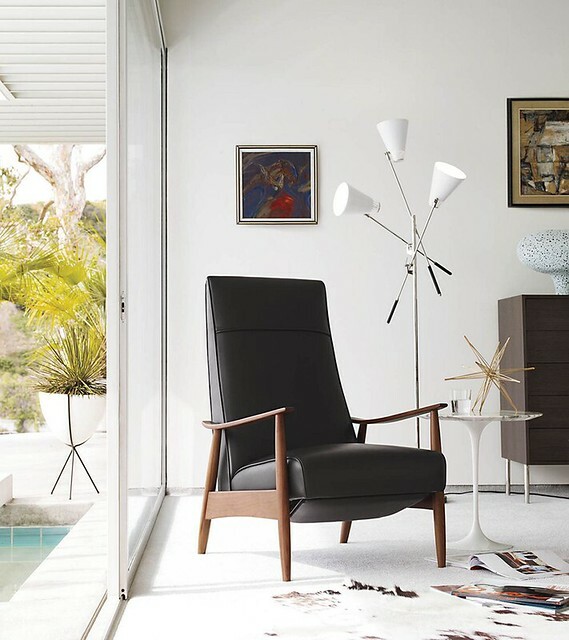 If you sit in an Eames, you may want it regardless of look. Besides, you can't look at the chair while you are sitting in it, especially if you are taking a nap. Herman Miller has started producing a bunch of custom options for the chair that DWR sells. Different color leathers and different wood frames. Changes the look a bit. Made it to DWR today. I sat in the eames, way too soft and the back was too short, this chair did nothing for me. The milo was the best chair I have at in so far, but I wanted it to stop halfway between the two recline positions, and I much prefer the separate ottoman to the flip up foot-rest. The milo is also a pretty good looking chair in person, better than I expected from the pictures. I will try and make it to relax the back next. At home, the best chair for me is a Century (not sure they're still around). Expensive, well made, large everywhere. Century is still in business. We have Stickley recliners that work well with my back. I like to go furniture shopping like......waiting around for a hurricane to pass. But, since moving to NC we discovered High Point, NC.....furniture capital of the world. Folks fly in to go shopping. Furniture Land South is the biggest furniture store I've been too......you could spend as much as two days working your way through 3 multi story buildings. Yeah, but what kind of bottom bracket will it have? That's one helluva recumbent Steve...what will the model name be...the Hampsten Rilassato? I've got a Lazy-Boy that rocks and reclines. I went to a big furniture store after a long ride and sat in about two dozen chairs before getting this one. I think it was around $400. I've got back issues including surgeries and this chair fits me well. Mike, oddly enough the swivel uses 10mm ball bearings - in some goofy standard - and I added a delrin washer and used all stainless fittings so it has that BikeTek™ feel. For a free chair rescued from rusting in a neighbor's backyard to this, I must say I'm feeling pretty happy with how it turned out. 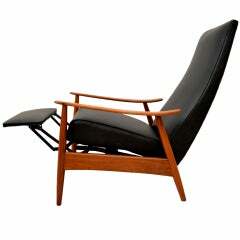 My brother-in-law has a chair that is similar in shape to this but reclined even more. It is the most comfortable chair I've ever experienced because it puts the body in perfect, gravityless, repose. There is no pressure anywhere and the user doesn't slide up or down or left or right. It seems to have perfect balance. I don't know the manufacturer but it's a really, really nice piece. We've looked for it in the past and can't seem to find it. A crashpad I was in for a few years had a La-Z-Boy that had the same effect, but was slightly less elegant in construction or design, but was surprisingly comfortable for a long night wasting away in front of the TV watching Packer games on his early 1980s console TV. Saab, the company is Homecrest and the chair is from the 1960s or 70s, I think it's called an Edina. It had an adjuster feature, which would have allowed it to recline further, but I removed that and I'm simply leaving the recline as it is. I bet if you searched you'd find something online. See, my warped sense of humour kicks in here and I am trying to picture the Lazy Boy in the Expedition for the drive to AZ. Can you reach the steering wheel when you recline?? The same Homecrest that made the furniture on my back deck?? The Expedition is the best road trip vehicle ever. Might as well be a recliner, the front seats are all power, air conditioned and heated, and all kinds of adjustment. It also has a memory, when I turn off the ignition the seat moves back so my generous Murican belly can clear the steering wheel. When I start the engine (push button) it moves back.